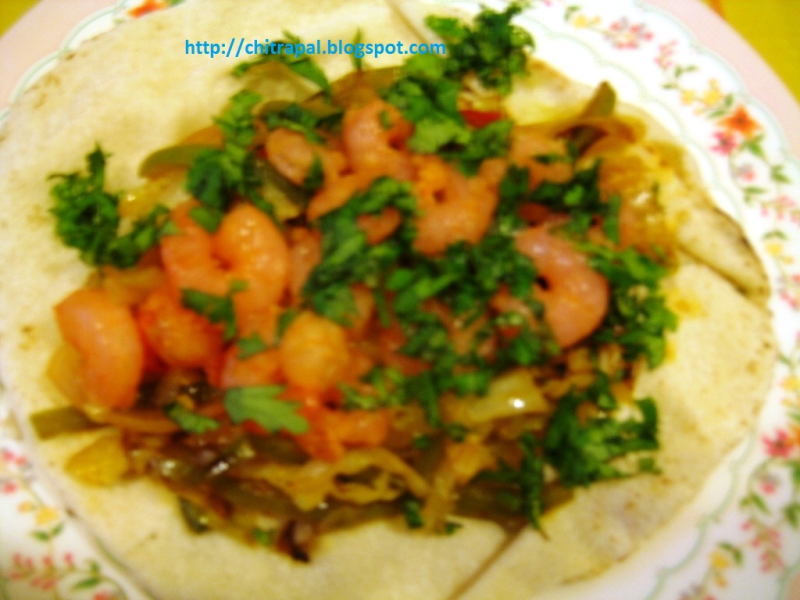 Corn Tortillas is healthier choice than wheat. Corn one's have less calories. Defrost the shrimps and dry them with dry kitchen towel. In a bowl mix lemon juice, little salt, black pepper and add the shrimps in it. Marinate the shrimps in this bowl for 20 minutes and keep it aside. In the mean time in a non stick pan add olive oil. Now add onions and bell peppers to it. When they crisp up add soy sauce and sesame oil. Sprinkle salt and pepper and red chili flakes and let it cook until the mixture is dried out. Now add the shrimps to the mixture and toss. Your mixture is ready. Now take the tortillas and warm them. Fill in the mixture on each tortilla, do not overfill it. Garnish with chopped cilantro /coriander / dhaniya leaves.